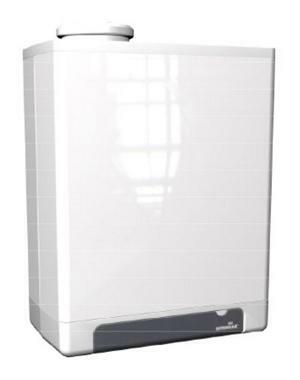 The Compact HRE SB system gas boiler is a condensing and wall mounted unit manufactured by Intergas. This boiler is a system boiler which means it will send hot water to the radiator and a sealed hot water storage cylinder for your taps. The most important parts of the system are built into the boiler which makes it more compact and easier to service. It can be controlled by either a regular on / off thermostat or with a programmable room thermostat to give you maximum control over your heating. This boiler has a SEDBUK rating of B as it can reach maximum efficiency levels of 88.9%. The boiler has an output rating of 23kW making the unit perfect for the smaller properties with one bathroom. Key features include a built in frost thermostat that prevents your boiler from freezing in cold weather when your boiler is needed most. It has no air pressure switch, is easy to service and maintain, has almost no standby losses and can be fitted with either a horizontal or vertical flue. This unit also features an 10 year warranty on the heat exchanger and a 7 year warranty on parts.